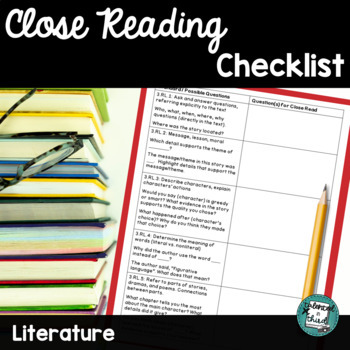 This Close Reading Checklist will work for ANY LITERATURE. 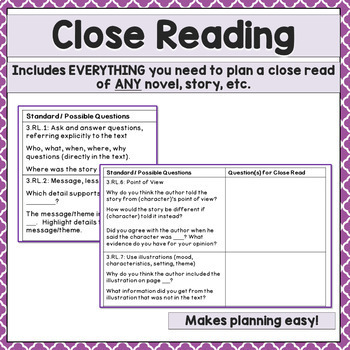 This checklist will help you plan a close reading for any literature text, covering every RL third grade standard. 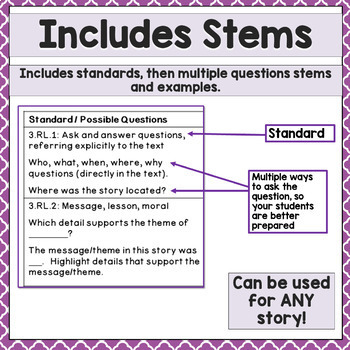 Possible questions and short descriptions of each standard are included along with space to write your own questions to fit the text you are working on. This takes the guesswork out of close reading and allows you to integrate close reading into your daily schedule. Just print the checklist and start writing questions for any literature. This would be a great planning tool in order to fully utilize whatever reading program currently in place, even a basal reader. This is all aligned to the Third Grade Common Core Standards, with a focus on asking questions that are aligned to the level of complexity the standards require. Many times, close readings will focus on the standards, but not at the right level of complexity, meaning students are answering questions below the level they need to. This practice doesn't actually help them develop the skills they need. This checklist will help you to focus on asking the right questions, so the practice will match the end of the year assessment, as well as helping your students develop the needed skills to do well in the future.